A change of season demands a change of tyres, and with a recent switch from winter treads to summer treads on my CX bike, I needed some more tubeless sealant. I decided Peaty's Tubeless Tyre Sealant would be interesting to test. 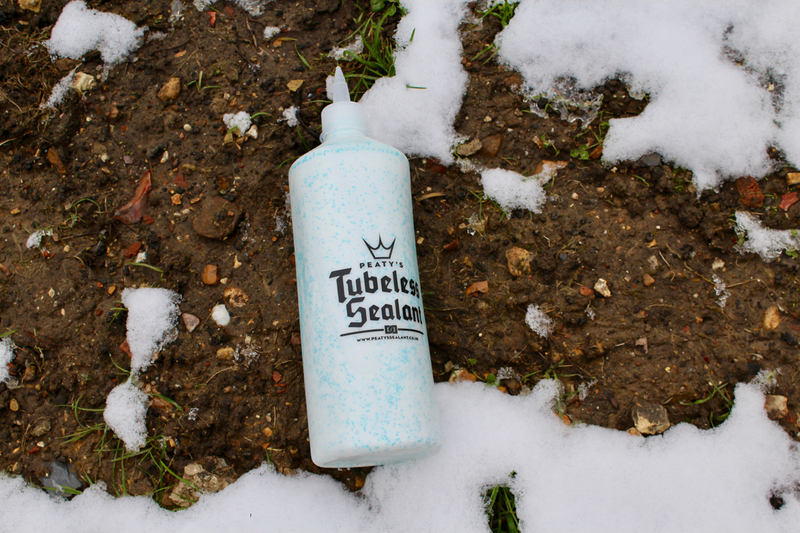 Testing tubeless tyre sealant is a real 'hit or miss' game. If it works, then the often-laboured efforts seating the tubeless tyre in the first place (read my Top Tips for Tubeless Tyres piece) are worth it, and the puncture seals itself with a satisfying clog. When it doesn't work though, you are left standing at the trailside cursing the test product's manufacturer, and wishing you had stuck with your normal reliable brand… Thankfully, my experience with Peaty's Tubeless Tyre Sealant is very much the first of these two. On springtime trails strewn with freshly cut hedge debris and washed out flints, my cyclocross bike equipped with 40c tyres has been up against a minefield of potential punctures. A few times this month I have heard that deflating sound of hissing air, as an offensive object has broken through the rubber; but each time it has been shortly followed by the satisfying sound of a successful seal. Peaty's seems to be good on both small and medium holes, and using a tubeless tyre plug I have also successfully repaired larger cuts in the tyre. The sealant is a lot thicker than most latex tyre sealants; this, combined with the glitter/granular texture (they call them 'nano-platelets'), undoubtedly helps the quest for a successful seal. I used 250ml of the sealant in a 700x40c tyre, and it seems to have been enough to create both the initial seal, and to keep away the puncture fairy for 50+ riding hours. Peaty says that the sealant also doesn't dry out as fast as major brand latex sealants, so it should have an extended lifespan in this respect too (I am yet to be using the sealant for long enough to vouch either way). To sum up, Peaty's Tubeless Tyre Sealant reviews well. It works. The initially gloopy appearance and glittery colouring make it look a little like PVA glue, perhaps from a primary school project gone wrong. Yet, the sealant has done an A-grade job of sealing challenging holes in my cyclocross tyres. With the BIG 1 litre bottle it comes in too, it should last a long time.